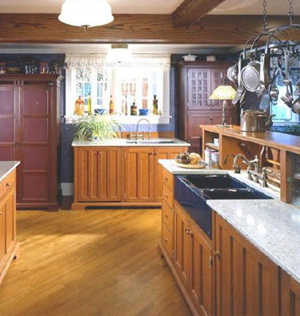 This large New York country kitchen is furnished with seven freestanding workstations that are centered around a red commercial style range. Though YesterTec specializes in concealing the hi-tech appearance of exposed ranges, especially in period themed rooms, this owner wanted to make their Wolf range a main feature of the kitchen. So we flanked the range with two identical freestanding B54/CB42 Cupboards, one on each side. By doing so, the range became even more of a statement, and the cupboards with their abundant counters are so much more useful than having a (fake) mantle built around the range that would have stolen this most needed flanking counter space. The freestanding wall sink base (S255-U) is the cleanup workstation that conceals an integrated dishwasher. To the left is a pie safe DO40-OM that safely conceals an extra oven and microwave. To the right of the sink is a C32C Cupboard that conceals the morning coffee makers, toaster and everyday dishes. 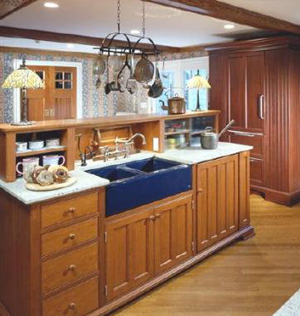 The breakfast table is behind the freestanding food prep island (S84-A-INT) that houses an undercounter refrigerator. 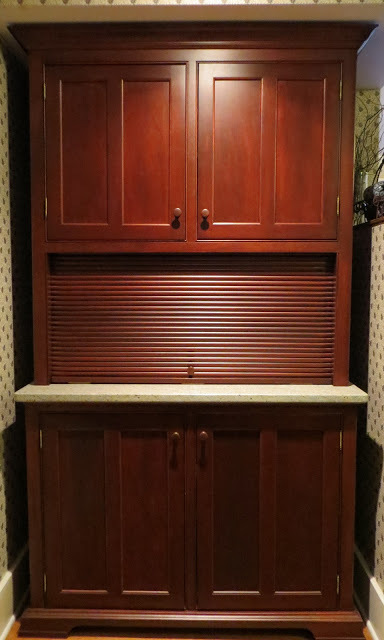 The Storage piece (ST2-A) above the sink hides the preparation area from the table. 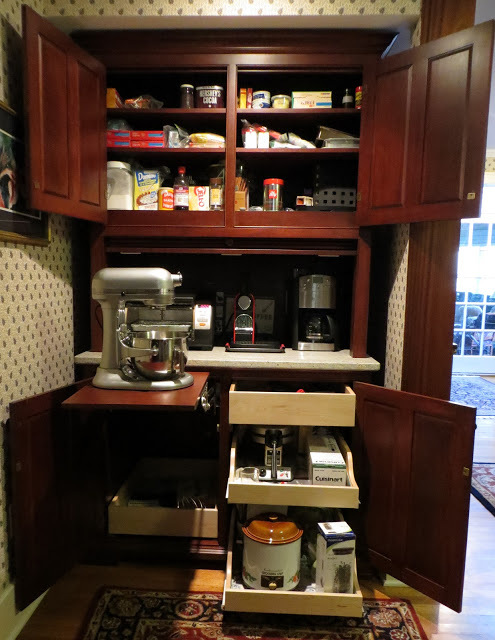 The Refrigerator pantry SZ15-27 features two pantries that open from the side. 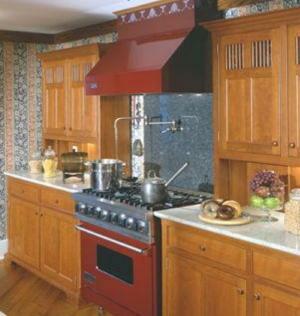 These side pantries replace typical top cabinets that are found in most kitchens. Here is a good example of how to keep a commercial style range as a focal point, but blend it into a kitchen that features unfitted furniture. These cupboards that symmetrically flank the range add importance to the range but bring the entire composition back into the realm of furniture. 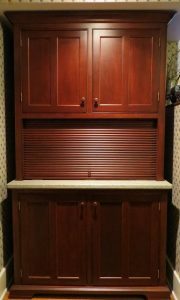 Just around the corner, a custom freestanding Baking Center conceals several appliances behind a tambour door that lifts up out of the way. Even the Kitchen Aid mixer lifts up and down easily. This piece is located in a hallway just adjacent to the kitchen, so it needed to have a discrete appearance considering the job that was required of it. Next ArticleEclectic Renovation leads to Better Meals!